Singer Kangnam and Korea’s speed skater Lee Sang Hwa are reportedly dating since filming their MBC ‘Law of the Jungle’ episode last year! 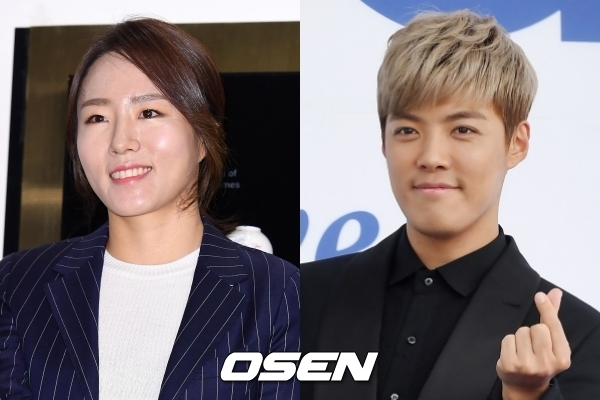 There’s a new celebrity couple in the industry-Kangnam and Lee Sang Hwa. On March 17, OSEN reports the couple has been dating for nearly 6 months already. Both parties have confirmed they are dating to everyone’s surprise. Kangnam and Lee Sang Hwa first met on MBC’s ‘Law of the Jungle in Indian Ocean’ last year for episodes 334-337 after-which they soon started dating. Congratulations to the couple for going public! Speed skater Lee Sang Hwa’s representative stated the two have been dating for the past 5-6 months and requested for everyone to watch over them as their relationship progresses.